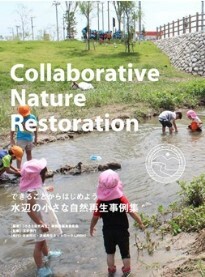 JRRN published “Cases of Collaborative Nature Restoration in the River” supported by the “Editing committee on waterfront collaborative nature restoration cases”, and supervised by Prof. Nobuyuki Tamai, ARRN & JRRN advisor. 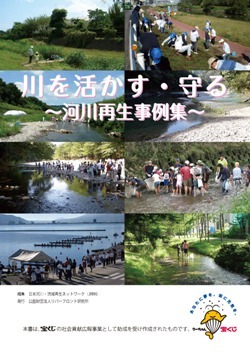 JRRN published “River Restoration Cases by Citizen's Groups in Japan” contributed by NPO, citizen's groups and administration offices in Japan. JRRN/ARRN published the "Reference Guideline for Restoration by Eco-Compatible Approach in River Basin of Asia ver.2" in March 2012 to assist all practitioners involved in the river restoration activities in Asia. This guideline is the second edition of ARRN's guideline to show basic ideas and policies indispensable for restoring desirable river environments in Asia, raise the interest of readers in a river nearby, create an opportunity toward new projects for river restoration, and also support current river restoration projects. JRRN/ARRN will continue to revise the guideline with the support of ARRN Technical Committee members. This book is a guidance document that aims to assist all practitioners involved in the process of setting monitoring protocols as part of a river restoration project. ARRN published the “Reference Guideline for Restoration by Eco-Compatible Approach in River Basin ver.1 Separate Volume” in January 2011. This separate volume was prepared as a supporting material of the “Reference Guideline for Restoration by Eco-Compatible Approach in River Basin ver.1” published in March 2009. ARRN published the “Report on ARRN’s Roundtable Meeting 2010 : How to develop technology and Guideline for river restoration through networks” in January 2011. The ARRN’s Roundtable Meeting was held in Seoul KOREA on 14th Sep. 2010 as the special session of “8th International Symposium on Ecohydraulics 2010”. 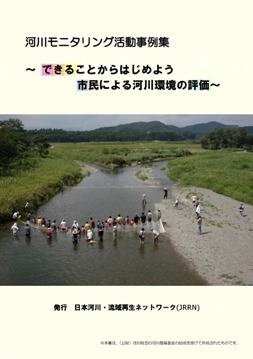 This book is an English translation of “A Challenge of Nature Restoration from the Standpoint of Ecological Engineering” published in Japanese in 2007. 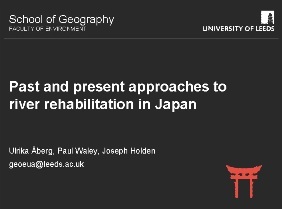 - This file was presented in the Session 7 in the River Restoration Network Conference held in UK, April 2009. 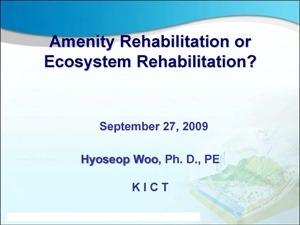 - This file was presented in the Session 3 "Cases Studies of Urban River Rehabilitation" in the World City Water Forum held in Korea, August 2009, and presented again in the 7th Joint Seminar on Ecological Engineering between Korea and Japan at the annual meeting of Ecology and Civil Engineering Society in September 2009 in Saitama, Japan, with some more clarifications and additions by Dr. Woo.